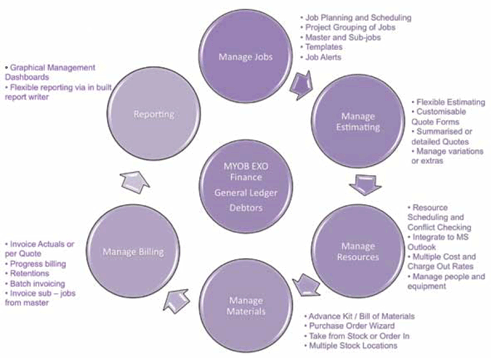 MYOB EXO Job Costing gives you a fully featured module for complete job and project cost management. It is designed to accommodate the whole life cycle of a job from quote and budget, all the way through to profitability analysis and variance reporting. 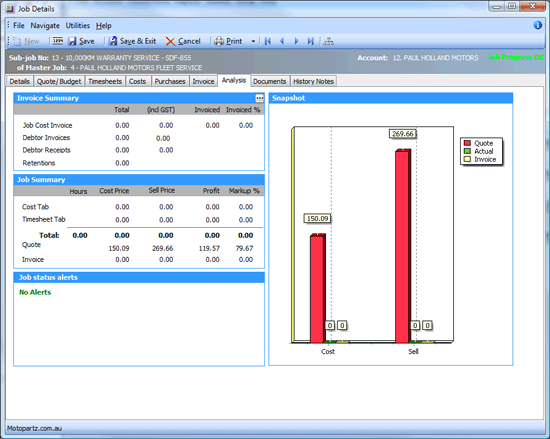 Every business has differing requirements for cost control and analysis. EXO Job Costing is highly configurable to suit both small jobbing operations and large complex multi job businesses, even allowing for differing departments within the same business operating with different modes, e.g. 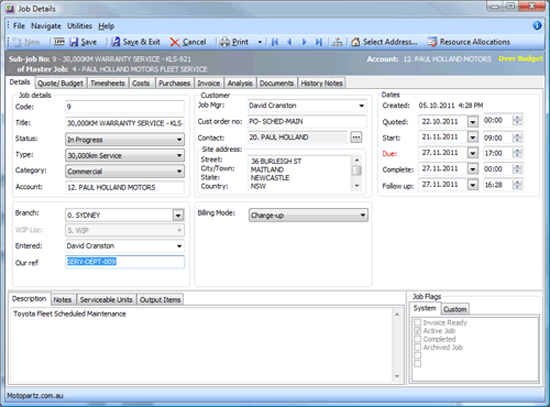 Service Dept, Production Dept and Installation Dept all through one invoicing interface. Invoice jobs in batches or individually for efficient job billing. EXO Job Costing provides support for ‘progress billing’; this enables the grouping of quote and/or actual lines within a job to be invoiced on a partial or ‘contract’ basis. ‘Retentions’ where a portion of the invoice value is withheld based on completion of the job is also catered for. With EXO Job Costing, your project information is always up to date to the last cost or billing transaction. This makes it easier to clearly see the budget, the current profitability and the expected profitability of a job – at any time. And with greater information about the current status of a job, you are far better placed to make decisions as the job progresses. MYOB EXO Business clients who use the EXO Job Costing module report tighter cost control, less disputes regarding mid-job amendments and increased profitability overall. One client described the difference as like ‘driving a car looking through the windscreen rather than the rear view mirror’. 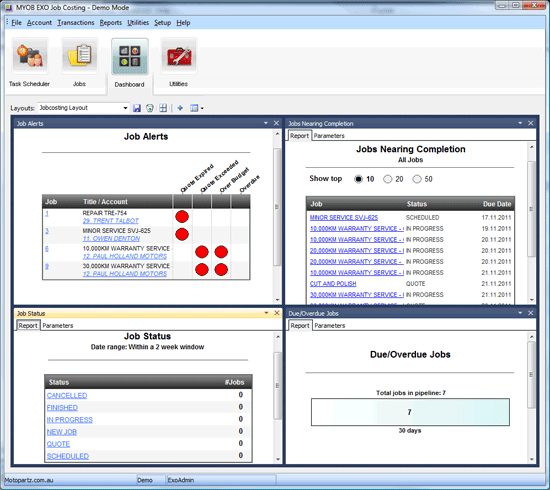 EXO Job Costing has a highly configurable suite of graphical dashboards and reports ideal for small jobbing operations and large complex multi job businesses. It allows you to accurately plan resources, track equipment hours, labour hours, materials purchase, subcontractor costs, other costs and inventory used on projects. You can view the real time status of yourjobs and quickly see jobs that are overdue or over budget allowing for complete cost control. Plan resources, job duration and delivery time through this powerful graphical and hierarchical tool. You will be able to identify any conflicts that exist with your resources. Previous jobs can easily be recalled used as templates with up to date pricing allowing your staff to quote more efficiently. Manage larger projects more efficiently by creating sub-jobs. This allows more effective management of component deliverables while maintaining the ability to consolidate and report on the larger project against defined budgets. Whether your business uses jobs to generate goods for stock or you make directly to order, EXO Job Costing will allow you to track all time and materials associated with a particular job and process it accordingly. Every company is different. That’s why EXO Job Costing gives you flexibility when it comes to presenting information to your team. 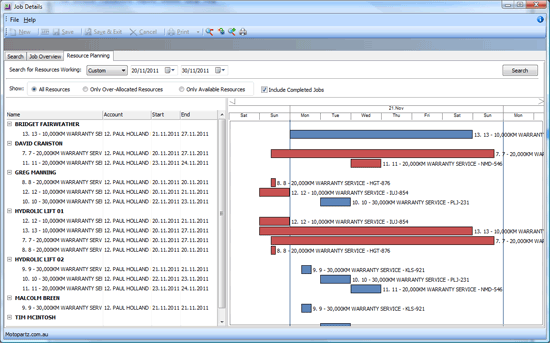 Show or hide columns as relevant, even change the order of appearance to assist data processing. Each user is able to save personal settings, which are re-loaded at login. Detailed quotations can be generated and stored for comparison with actual job costs to highlight variations using EXO Job Costing’s graphical analysis display. Timesheets can be entered directly against the job; or through the direct timesheet entry screen. Designed to eliminate many of the problems surrounding time capture, EXO Job Costing makes it easy for your team to keep project information up to date. Remove double entry by sending the timesheet information directly to EXO Payroll to pay your employees. EXO Job Costing provides you the ability to analyse various areas of each job including Job Status, Job Types, Job Categories, Cost Groups, Cost Types, Job Resources and Quote Terms. Snapshots of your job allow you to easily see how you are tracking to quote/budget. The task scheduler makes it easy for individuals to see which jobs they have been assigned to and to drill down into the job details. 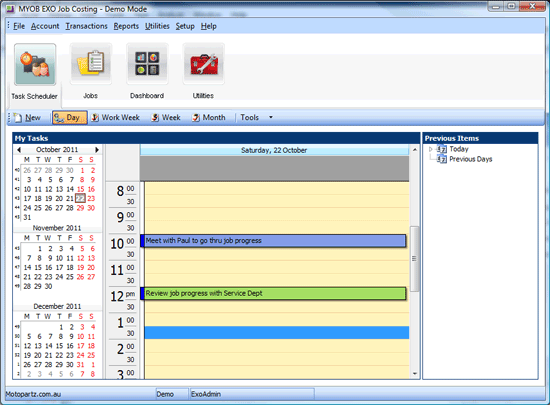 Integration with Microsoft Outlook allows you to keep your Microsoft Outlook calendar up to date with your assigned jobs. EXO Job Costing makes use of EXO Finance powerful contact and document management features. You can store contracts, images and plans against specific projects creating a single repository for important information allowing access for all involved.